The Dorfman, National Theatre played host to The Alfred Fagon Awards supported by The Peggy Ramsay Foundation on Friday 8th December. The Award recognizes and celebrates the depth of talented Black British playwrights of Caribbean and African descent writing in Britain today. 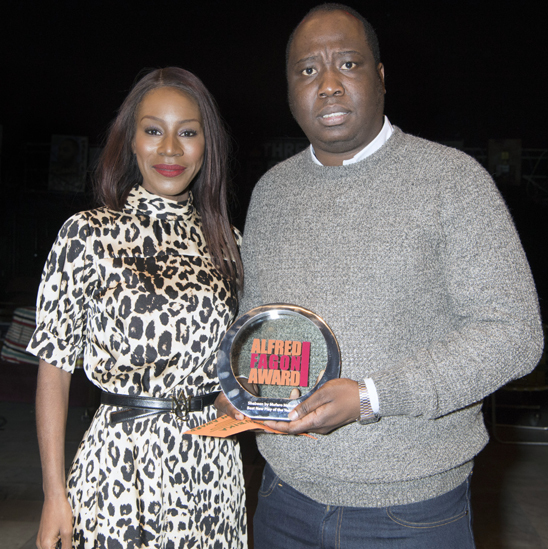 BAFTA award winning writer/director Amma Asante was among those who presented the awards. Amongst the winners was Mufaro Makubika winning Best New Play of the Year with Shebeen: a play about St Anns, Nottingham, Caribbean community and its history. Akpore Uzoh won the Audience Award for plays staged between September 2016 and August 2017 for his play ADITL, A Day in the Life. The recipient of the Roland Rees Bursary, named in honour of the co-founder of the Alfred Fagon Award and leading theatre director, was writer Beverly Andrews, who was awarded by writer Mark Norfolk, the first recipient of the bursary in 2015. The shortlist included Archie Maddocks’ Nine Nights, David Judge’s SparkPlug, Inua Ellams’ Barber Shop Chronicles and Melanie Pennant’s A Black Fella Walks into a Bar.